Property 1: Alrose Villa, wrap around balcony sea/hill views, minutes walk from beach/ town. Property 7: Lovely 2 bedroom peaceful Dorset apartment, horse stable hire possible to ! Property 8: Annex flat sleeps upto three with daily free breakfast, Hot Tub, 5 Star reviews! Property 12: ⭐️ Great Rates for Easter breaks ⭐️ Excellent Central Location. 2 Beds, Sleeps 4. Property 14: A cosy 2 bedroom character property in Lyme Regis, 4 min walk from the seaside. Property 15: Large 3 bedroom 1st Floor Apartment in a quaint Purbeck Stone Cottage. Property 30: Newly listed* The Hydeaway - Charming 1 bedroom rural retreat. Bright and modern family friendly apartment 2 mins from the beach . Property 40: Bright and modern family friendly apartment 2 mins from the beach . Family Friendly With Parking And Patio. 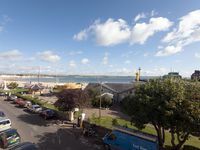 Located In The Heart Of Swanage. Property 42: Family Friendly With Parking And Patio. Located In The Heart Of Swanage. Property 49: Lovely 2 bedroom peaceful Dorset apartment, horse stable hire possible to ! We enjoyed our stay at the property as it was very comfortable and cosy. It suited our family of five very well. Very clean and well looked after. Despite the bad weather we had during our stay we still enjoyed the views from the flat.